This is an entry about one tenderloin sold in two places. It all started in Dewitt, Iowa, along Old Route 61 at TC's Point After. Its a small town sports bar with a large menu. 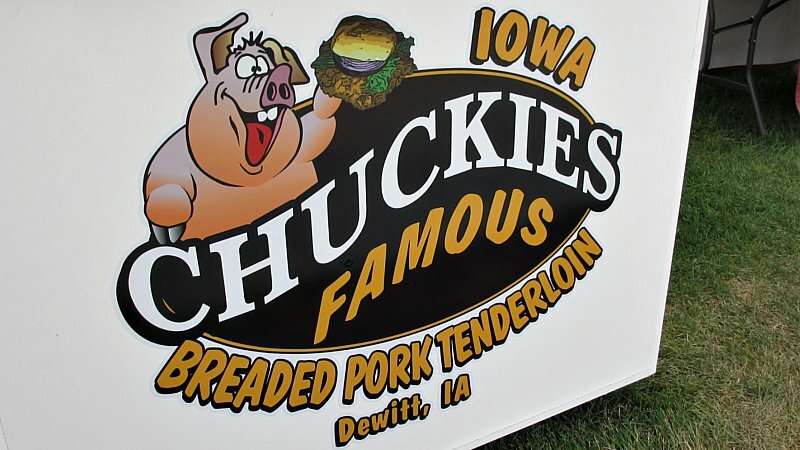 It sounds like Chuckie sold his stake in TC's Point After in order to take his tenderloin truck to locations far from Clinton County, Iowa. Its been spotted in Denver, San Diego, and at Cactus League baseball spring training sites in Arizona. 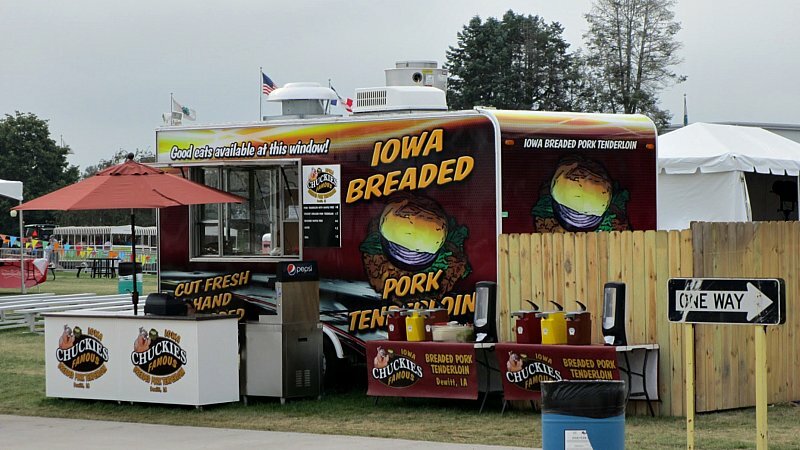 A recent spotting at the Iowa State Fair meant I could get a chance to try the mobile version. This is also the first homemade pork tenderloin I've found at the State Fair, most concessions use the awful half-pound frozen fritters. Location: 719 6th Ave. in Dewitt, Clinton County, Quad Cities area in Eastern Iowa. Directions: Its on Old Higway 61, the original main street through Dewitt, now you have to take a turn off the State Highway to drive up along 11th St to reach 6th Ave.
Online At: you can try to follow TC's or the mobile trailer at their facebook page HERE. 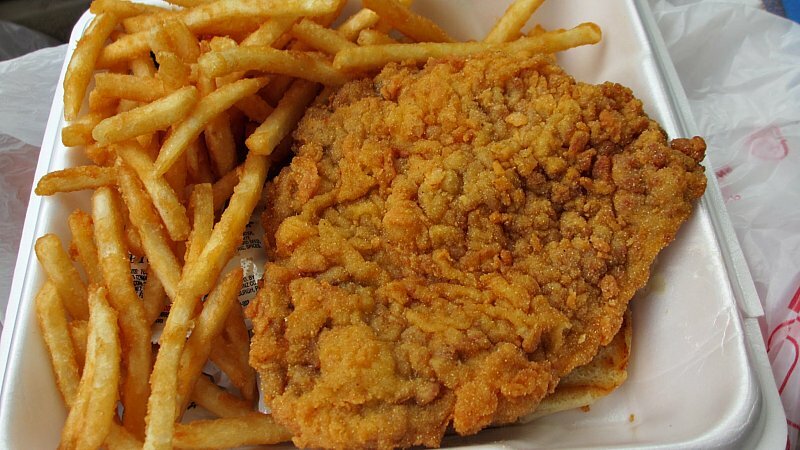 Chuckie's Famous Tenderloin: The video interviews with Chuckie include references to "special flour" and 14 seasonings inside the batter itself. There is a lot of depth in the texture of the batter, this can be seen by the little dots or different seasonings. Chuckie even calls his center cut of pork loin the "ribeye of the tenderloin". The tenderizing is done "fresh" at the mobile trailer, and I take this to mean they cut and mechanically tenderize it to order. The loin is not big, it feels like six ounces. The result of the preparation is a great subtle breading flavor with nice soft white pork loin. This is a good sandwich served on an untoasted bun. Overall 9.1 out of ten. Price: Vending fees and other things affect the prices at any truck. From a video on the QC news website shows a setup in San Diego, California with the tenderloin being sold for ten dollars a la carte. 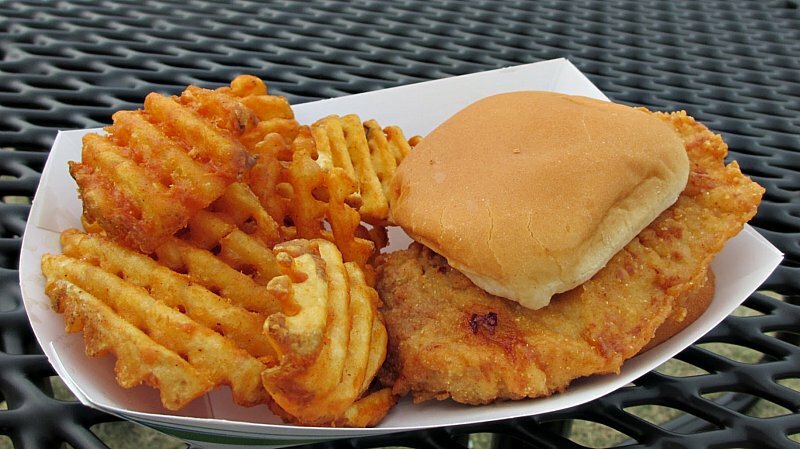 At the Iowa State Fair it was $8.00 for a tenderloin with waffle fries. The picture below is from a while ago at TC's Point After, so don't get angry if its gone up. Also on the menu: The sign outside TC's Point After reads Steaks and Prime Rib along with Food and Spirits. The menu is huge with burgers and daily specials. The truck was literally just tenderloins and waffle fries. Service: Just regular sports bar service in Dewitt, I grabbed the loin to go. The truck looks like a two person operation when I visited during a slow time. Ambiance: The Point After in Dewitt is a very clear Chicago Cubs and local teams sports bar. It has dated woodwork and old fixtures, thankfully covered by sports junk. Its pretty dark inside, so pictures were impossible. I think they do group tours to visit the Cubs in Chicago. In a basket with waffle fries. Final thoughts: This is a sandwich that travels well. 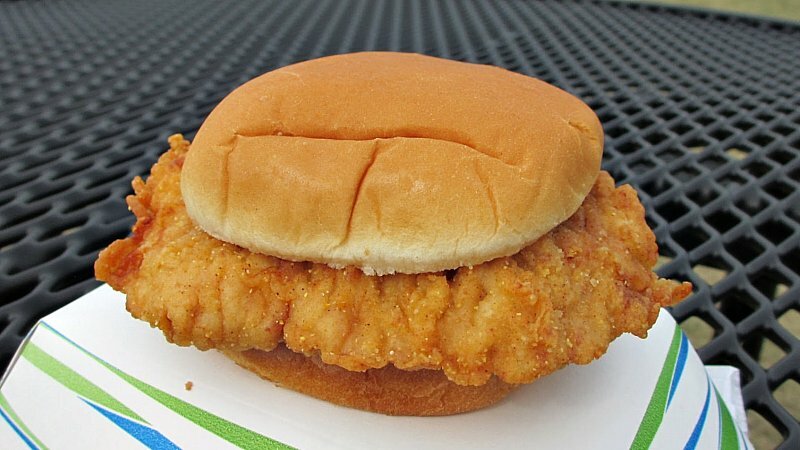 I mean it gets around more than any other tenderloin. I know some small town cafes will have mobile trailers for local county fairs or dirt track racing nights. These rarely leave the State of Iowa. I can say with some confidence that Chuckie will be back at San Diego Chargers home games this fall. I would guess they would be available for events in the Southern California or Arizona area too. That is one happy pig.